Olympique de Marseille welcome FC Lorient to the Stade Velodrome to kick-off the Ligue 1 weekend on Friday evening. OM are desperate to stop the rot. Several weeks ago they were in the midst of a title challenge. However, in their last five matches they have haemorrhaged points, winning just four of their last possible 15. Admittedly, they were unfortunate against Olympique Lyonnais, when the referee missed what would have been a late winner by Lucas Ocampos. The Argentine’s effort crossed the line, but was missed by the officials. They capitulated at home against Paris Saint-Germain in another decisive match, with a half-time 2-1 lead soon becoming a 3-2 deficit. Les Olympians haven’t recovered and the wheels have well and truly come off in dismal home defeats to Girondins de Bordeaux and, latterly, FC Nantes. They were shorn of star men Andre Ayew and Andre-Pierre Gignac in the loss to the Bordelais, where they lacked attacking cohestion, but against the Canaries, there was little excuse as discipline and composure steadily deteriorated. The run of three successive losses has recalibrated expectations at the Stade Velodrome. No longer are Marco Bielsa and his team talking of the title, the legendary Argentine boss is now focused purely on salvaging a season that promised so much but which is, ultimately, threatening to end in disappointment. Salvation would come in the form of Champions Leaague qualification, but there are no guarantees. Such as OM’s slump, and such is AS Monaco’s consistency, that the Southern giants have now slipped out of the top three. Indeed, with only five matches to play, they are two points behind ASM and heading for the Europa rather than the Champions League. It is imperative that the Phoceens stop the rot on Friday evening when they welcome Lorient to Provence. Fortunately for Bielsa and co. they are encountering one of the teams in the division whose confidence is in an even worse state than theirs. Two weeks ago, Lorient sat outside the relegation zone facing two six-pointers against already-doomed Racing Club de Lens and fellow strugglers Toulouse. Win those two and Les Merlus would pull further away from the drop zone, plunging their two rivals further into trouble in the process. Things haven’t worked out that way; Sylvain Ripoll’s site were muted against Lens, managing only a 0-0 draw and mustering a hapless display, while they were even worse against Toulouse, losing 1-0 last weekend in a potentially-decisive contest. Lorient have scored only once in their last four and not at all in their last three. They are in danger of slipping out of the division with a whimper. One man who can save them is Jordan Ayew. The Ghana striker is the Bretons’ best hope of goals—he has bagged nine so far this season—and ought to be extra-motivated. Not only is he coming up against his former club—he left OM last summer—but he will also be facing his brother and Black Stars teammate Andre. 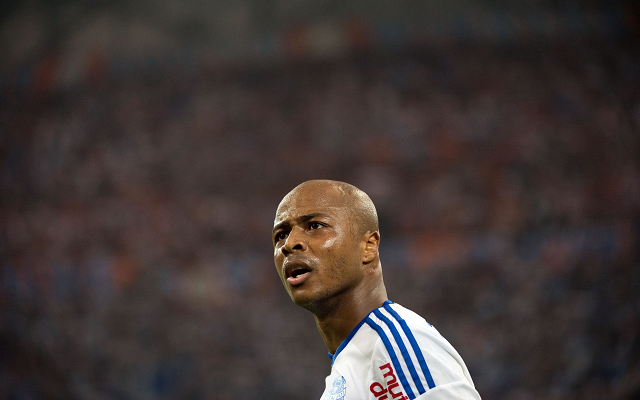 The elder Ayew will also be keen to impress as he comes towards the end of his contract at the Stade Velodrome. AS Roma and Spartak Moscow have already made approaches for the player, while numerous major clubs across Europe are also monitoring his situation.